Bold. Beautiful. Beton Brut Design. Amanda Nogier, of Béton Brut Design, is bringing us her gorgeous concrete work again! We can't wait to see her new pieces. 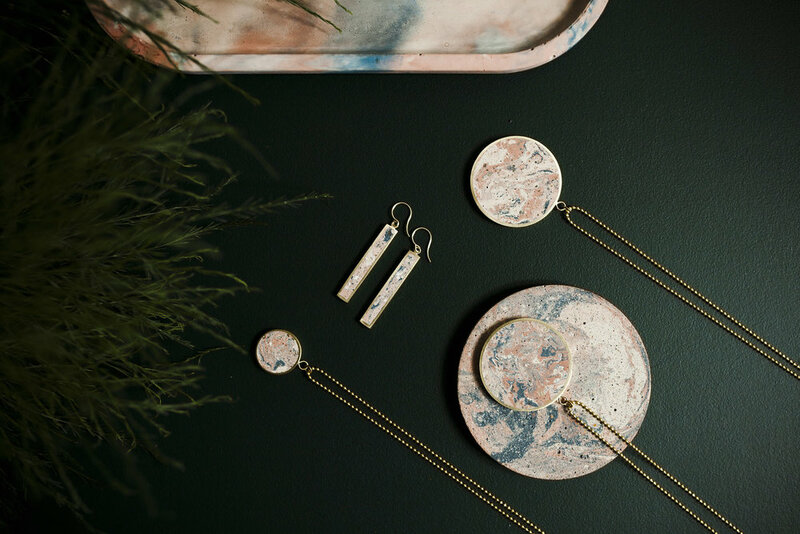 Béton Brut Design is a concrete jewelry and home décor company utilizing handmade and industrial processes. Amanda is one of the most pleasant people on Earth to talk to as well, do yourself a favour and introduce yourself if her booth isn't being swamped with purchases! You can keep up with Béton Brut Designs progress on instagram or twitter (@betonbrutdesign) and keep on reading to see what has been inspiring Amanda to create lately and what she has in store for 2018! BBD: There is nothing that makes me happier than being able to spend my day designing and working with my hands creating beautiful objects from ordinary materials. Now that I have perfected my process I have been hard at work in the studio designing an entire line of new jewelry that utilizes my industrial design background and 3D modelling expertise. BBD: My 2018 is essentially me just focusing on designing new pieces and experimenting with some new processes that I have already been playing around with over the last couple months. I’m never going to stop pushing myself and my work to new levels and 2018 will be another year of experimenting and testing to make unique pieces unlike anything seen before. BBD: Honestly I tend to crush on the people closest to me because there are so many rad people doing amazing things that are right beside me in the markets and shows that I attend. I am lucky to be surrounded by friends who do awesome things! You can check out the rest of Amanda's amazing portfolio of work by heading on over to www.betonbrutdesign.com.